Meet our fleet of vehicles! 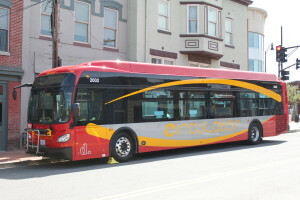 The all-new, 3000 Series electric Proterra E2 Catalyst bus arrived in the Circulator fleet in May 2018. They were manufactured in the United States and run on 100 percent battery electric propulsion. 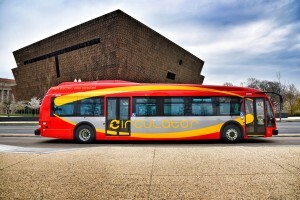 The vehicles bring clean, quiet,zero-emission transportation to more than 4.8 million annual riders and the Circulator’s approximate 200 drivers. 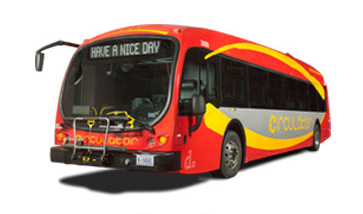 The New Flyer Xcelsior® model buses began service in August 2017. They are manufactured in the United States and use clean diesel technology to drastically reduce harmful particulate emissions, and offer the greatest passenger economy. They are the first in the fleet to offer added amenities such as dual-screen infotainment systems (i.e. digital displays that provide real-time information) community seating, advanced pedestrian and bicyclist safety alert system. Eliminate “unhealthy” air quality index days, including “unhealthy for sensitive groups” days. 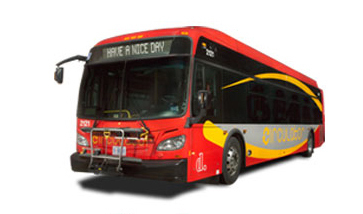 The New Flyer Xcelsior® Hybrid model buses began service in June 2015. 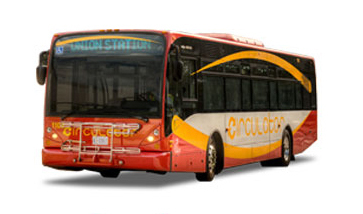 They are manufactured in the United States and use an efficient mix of clean diesel technology and electricity to provide cleaner, sustainable transportation. 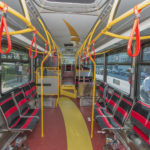 They are the first in the fleet to offer popular amenities such as USB ports, powerful roof-mounted air conditioning, and large LED overhead displays. 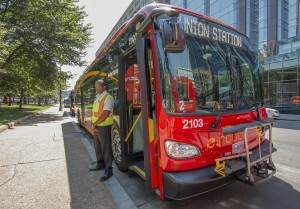 The 18 40-foot hybrid vehicles, made in Minnesota, were ordered in 2014 to help facilitate the 2015 launch of the National Mall route, where ridership exceeds 400,000 annually. Our new vehicles offer the latest in comfort and technology! Wider doors, larger windows, community seating and increased standing room help make the entire ride easy and comfortable for all. Charge up with USB ports near almost every seat. 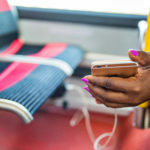 Connect with free public Wi-Fi on all new buses. 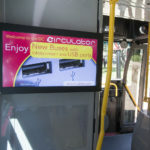 Get the latest commuter news and entertainment during your ride from our new digital display screens.